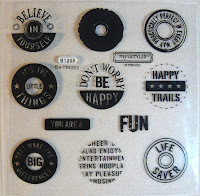 Happy Forever is the name of this super cute stamp set of the month. (D1423) It features four adorable hedgehogs in various poses, each with a Winnie-The-Pooh-like tummy and sweet face, plus phrases that fit perfectly with the happy feel of this set. It must be a really big hit, because over 70 Close To My Heart consultants are in on the Blog Hop this month! I can't wait to see what everyone's created. If you're already hopping, you came here from Shirley Ross's blog. 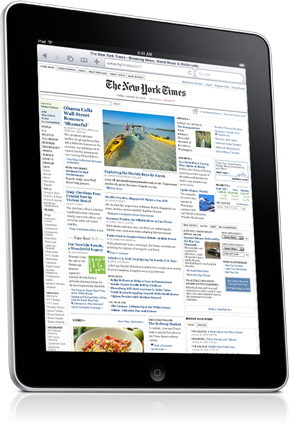 Keep reading to link up to the next blogger at the end of this post. 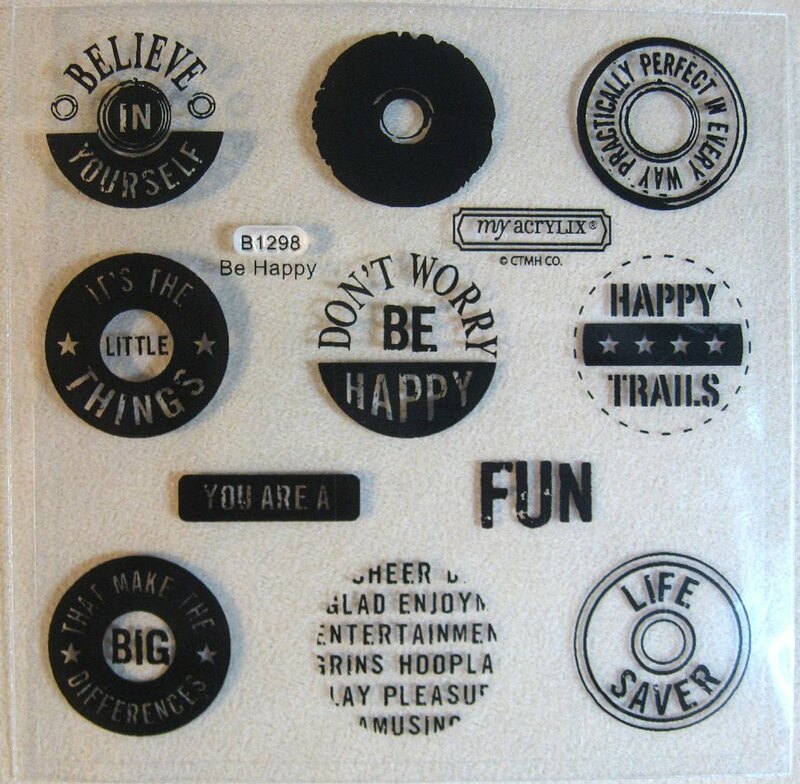 You'll find all kinds of great ideas for this stamp set along the way. I'm quite sure you'll enjoy it. I thought the Zippidee papers were playful and fun (X7125B) with this set. My card is fairly simple. I stamped the phrase onto a chipboard bookplate sponged with Sunflower ink and added Cranberry ribbon. My hedgehog guy is stamped in Archival Black then colored in with markers creating a little shading here and there. I cut everything out very carefully--whew, those balloon strings were tricky--then popped him up with foam squares. 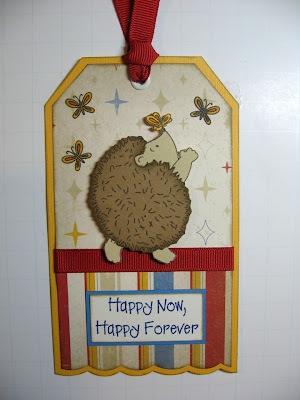 For the tag, I stamped the hedgehog twice using black ink. Once on Chocolate cardstock, once on Bamboo. Then I cut out just the spiney part from the Chocolate CS and the whole thing from the Bamboo CS and then paper-pieced them. Again, it was a bit tricky cutting around the butterfly on his nose, but worth the effort. Now let's get back to hoppin! 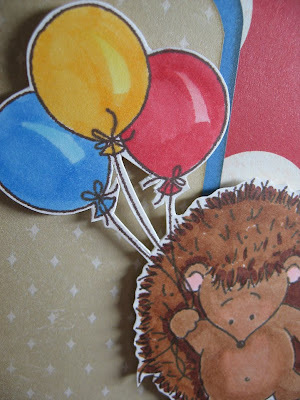 Check out what Dawn Heuft's done with her hedgehogs! Sometimes you just need something cute and quick, so I'm not really teaching you anything new today. Just showing you something cute and quick. These little projects are great with left over scraps of paper and those random pieces of ribbon you've been holding on to. 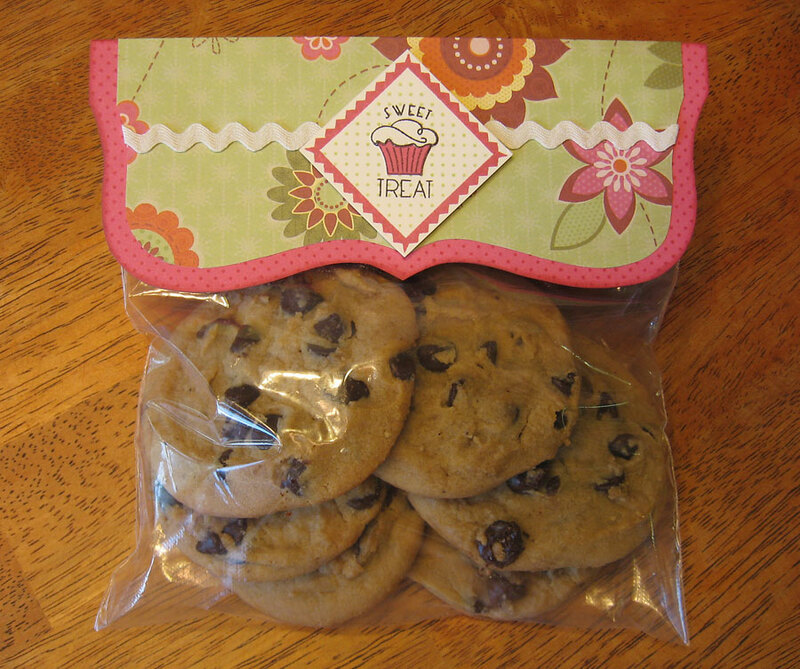 I made a template of the cookie treat bag topper so I could make more later. 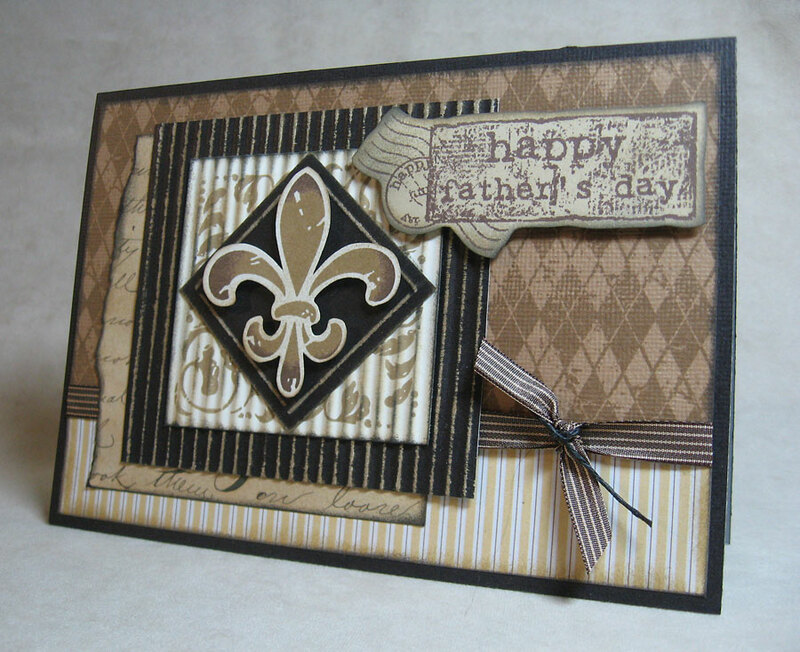 I created this template by tracing a bracket-shaped piece of chipboard I had stashed away. The cookies are in a simple sandwich-size zip top bag. I used some older, but WAY cute paper called Boom-di-ada, which I still love and is still available. (X7095B) The stamp set is Tasty Treats (D1427) and the ribbon is from our Colonial White Collection (Z1126). The cookies are Otis Spunkmeyer Chocolate Chip. YUM! 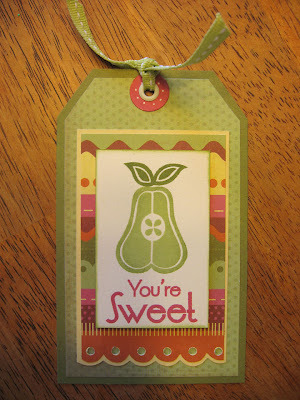 There's something about a custom gift tag that really seems to make people smile. This one could also be attached to a sweet treat, or a homemade pie for a 4th of July party hostess, or on a thank-you gift. 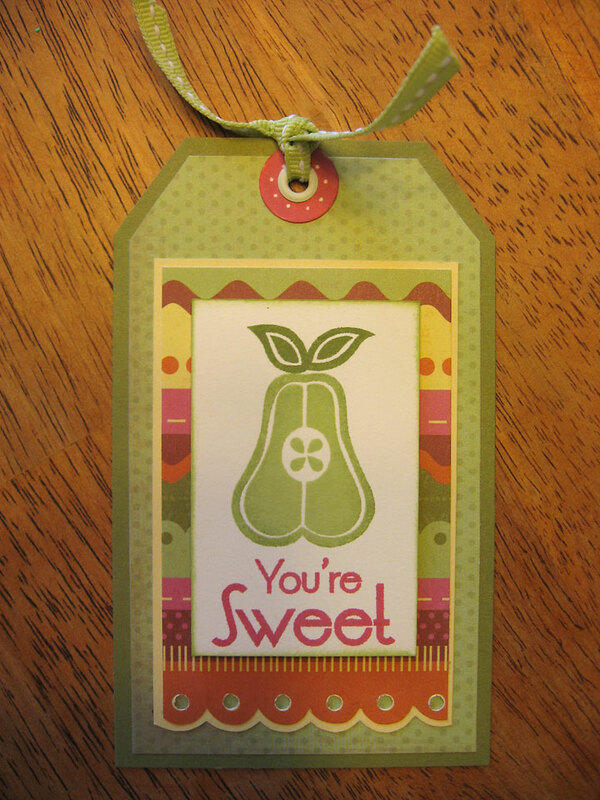 Again, I used the Boom-di-ada papers plus ribbon from our Sweet Leaf Collection (Z1125), and the stamp set is "You're Sweet" (B1351) which you might recognize from the take-out box I created in an earlier post. (See May 2010, Sweet Summer) It's one of my absolute favorites in the Summer Idea Book. Lots of cute fruits to play with. You may sometimes wonder why I don't seem to keep up on my blog as much as I should. Believe me, I'd love it if my life would allow me to create something pretty each day and share it with you, and write all about it. But sometimes there's just labor to be done. A labor of love, for sure, but labor nonetheless. 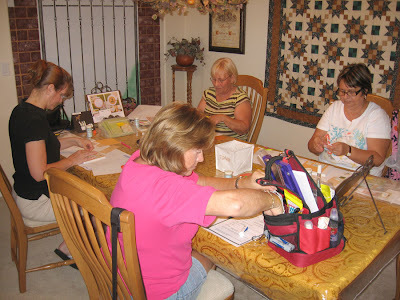 So all last week and this weekend, I have been preparing for my Splendor Baby Board Book Workshop for 15 people. 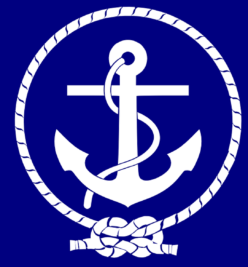 Five of which were home kits. I thought it might be interesting for you bloggers to see what goes into getting ready for something like this. 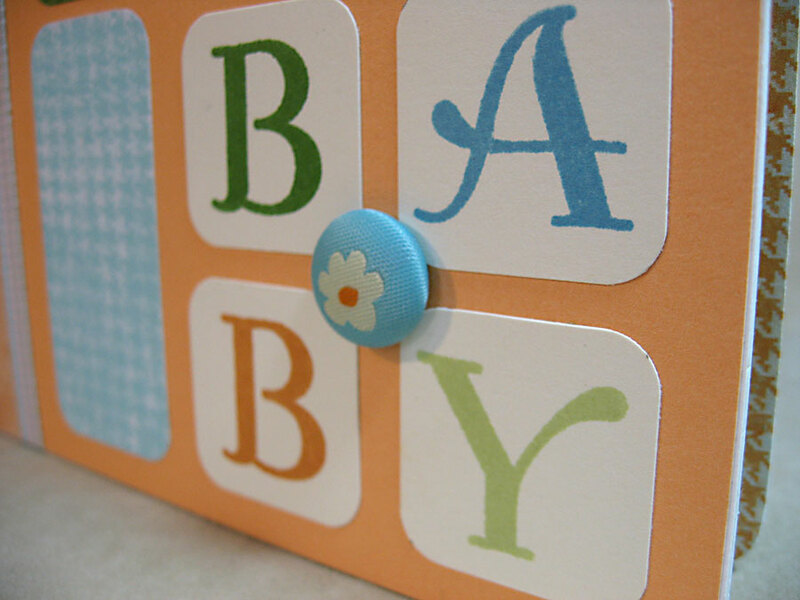 Keep in mind the workshop was designed so guests could choose Baby theme, Pet theme or a more General theme. Here's a peek at the book again. I posted it a few weeks back also. Of course, the very first step is designing the thing. I cut a paper pack down into fourths and tried to stick with that, but it turned out that I needed additional cardstock, so I had to make adjustments. 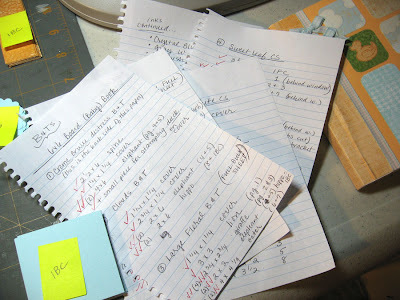 After it's all designed, I take down all the measurements of each piece of paper. 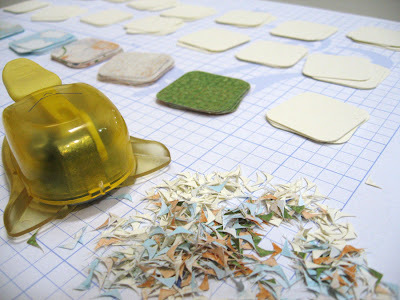 Then I cut all those papers, make little piles and label each one according to the pages they will go on. A ten page board book for 15 guests is a lot of piles! This took a few days just for the cutting. I try to keep the little details to a minimum for my customers, so I go ahead and cut the corners of papers, for example. Let's do the math here: 150 pieces with four corners to cut off equals 600 corners. Then I sort each page and bag them up for each guest. This is an extra step, but keeps things really organized for everyone. I put these in little bins at each station so they can pick one up and quickly get to work. 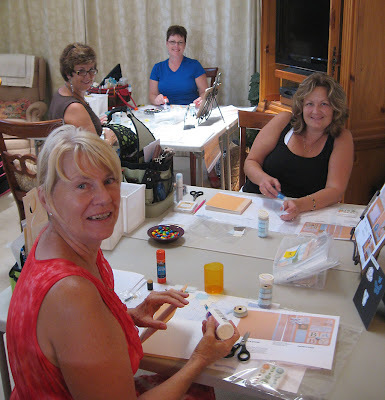 Each table has a photo on an easel of the pages they'll be creating. 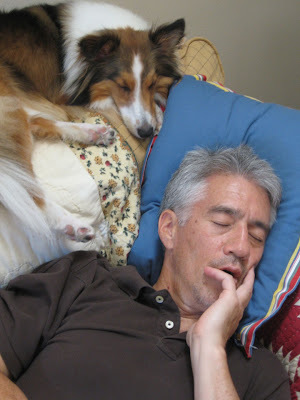 This is what part of my family is doing while I am getting things ready the day of the workshop. 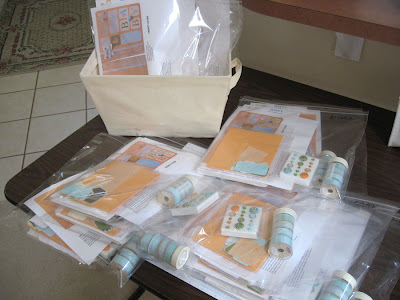 Then I bag up larger kits with all the basic supplies each guest will need to get started on the front and back cover: the board book, the ribbons, brads, cardstock for stamping, papers, and photo sheet to follow. Then, my guests arrive and settle in for about four hours. These gals are just getting started on their first page. I had ten guests in attendance, and five that requested a take-home kit. "Everybody look up and say Cheese!" I made Christine and Charmin keep stamping for the photo. Good sports! After some laughs and lots of creative time, and just a little bloodshed (we had two scissor injuries), they all finished their board books. They look pretty happy, don't they? 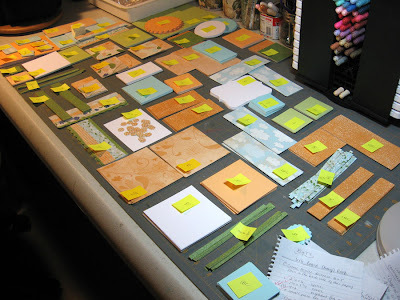 The effort going into a workshop of this degree is worth it when I hear little comments during the workshop like, "Oh, this is SO cute..." or "I love this stamp set..." or to be told at the end that everything was very organized and easy to follow. So if you ever attend something like this with YOUR consultant, keep in mind the effort she puts into it. And most importantly, remember this before you cancel because you "just don't feel like going." Close To My Heart's annual Convention is coming up this July, and if you've ever been to something like this, you already know that it's an extremely fun time. And that's really putting it mildly. I am actually busting at the seams, hardly able to wait the next 13 days until it's time to get on that plane to Washington, D.C. We'll be at the Gaylord Palms, which looks amazing. If it's anything like ours in Orlando, it's sure to be wonderful. Part of getting ready for Convention is getting my team ready too. They can technically handle it, I'm sure, without me, but I like to be the one to stir up the excitement! 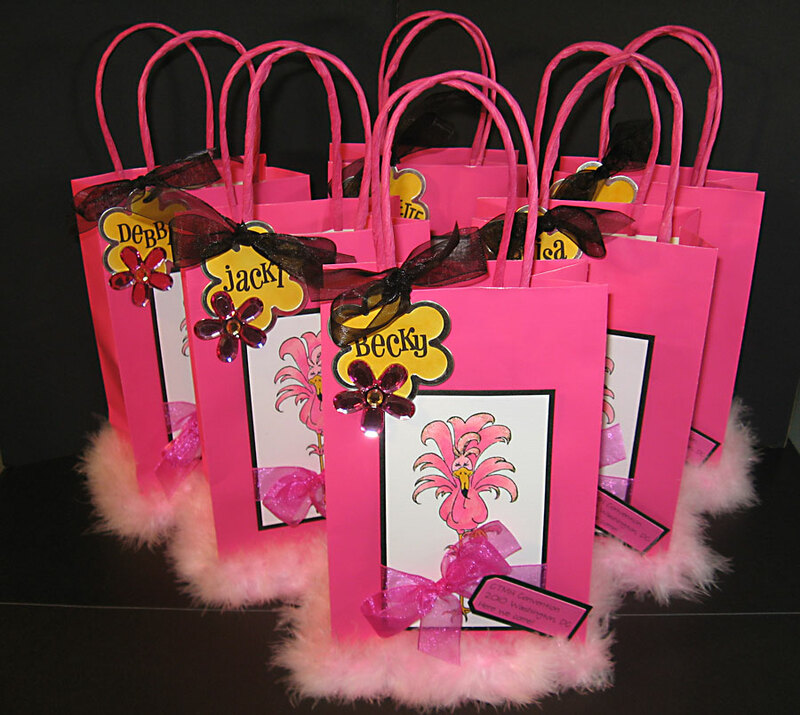 So last night, six gals from my team (we're the "Flamingo Gals" since we're from sunny Florida) came over for a little kick-off party. Picture pink balloons, flamingo themed decorations, and pizza! I made up these little bags for everyone using craft items around my room. Inside the bags are some survival items such as tissues (there's a lot of heartfelt moments at Convention and none of us had tissues last time), a pink box of Hello Kitty bandaids (in case someone gets carried away at one of the Create & Takes), a miniature tin of Altoids (in case someone sits next to me after having a big cup of coffee), a big Flamingo brad to attach to their name badge, and a handmade business card holder (so they can meet new friends and exchange info.) We spent some time going over our plans for Convention, what to bring, our agenda, etc. but most of all laughing. I have such a great group of girls and I wish ALL of them could come, but I'm sure the seven of us will have an excellent time. During the day, while making up these bags, the good old Fed Ex guy showed up two days early with my iPad! I almost hugged him right then and there, but instead I opted for jumping up and down like a three-year-old. It killed me to have that package and not be able to open it and play with my new toy. But work had to be done first. After finishing the bags, I finally had a few minutes to check it out, and then after the "Gals" left, I spent more time getting to know it better. Let me tell you, it's truly FABULOUS. Naturally, my 12 and a half year-old loves it as much as I do. We both stayed up a little too late last night downloading Apps and choosing an e-Book. Initially, when the iPad came out, I was going to wait a year, but with Convention coming and my need to stay connected not only to YOU but to my family, I felt it was time to go ahead and get it. This way, I can blog about Convention (sadly, without photos since the item I need to accomplish that is on back order) each day and slip e-mails to my daughter here and there. She loves to hear about what we're doing each day. So keep an eye on my blog come July 6 - 10 and I'll share my fun at Convention 2010. I have a feeling there will be LOTS to share! My gal pals and I went to StampFest Orlando (a tradeshow style of shopping arena featuring all things stamping and papercrafty) this past Saturday, and OH the damage we did! But before I get to that, when you go to something like this with four friends, you can't just jump in willy nilly and start off in all directions. The plan of attack (initiated by me, the control freak) was to do an initial sweep, traveling quickly up and down each aisle, getting a sense of each booth without getting distracted and certainly NOT stopping. Then, after the full round, we would take our time and visit each booth we liked and reconvene at 12:30 for lunch. This sounded good... in theory. 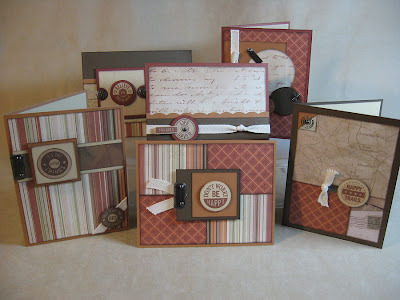 Okay, now I know I'm a CTMH consultant but I've always been very open about my deep passion for the Tim Holtz style: Vintage, grunge, deliciousness! So you can imagine how the whole plan of attack went out the window for me when I hit the Stampers Anonymous booth. I wasn't even halfway through my sweep! I was drawn in like a moth to a flame. The voices and sounds around me faded to a low-humming, and something like Hallelujah began to play in my head. The lights became brighter, colors more vivid. 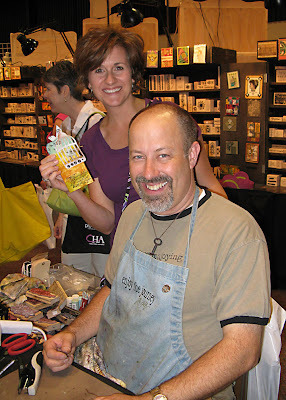 With some sort of gravitational pull, I was moving toward the wall of Tim Holtz' Idea-ology findings. Gears, keys, fragments, adornments. Everything I wanted was there. I snatched one of each! I turned and there were his newest paper packs, specifically "Lost & Found" which I have been wanting for some time. I snagged TWO of those babies. One to ogle and drool over. The other to actually use. The stamp wall beckoned me, and although I purchased just a few, I resisted the urge to buy too many stamps. For one thing, I am spoiled with CTMH's clear stamps. They are the best! But I promised myself that if there was something that I just couldn't live without, I would allow myself just a few wood-block purchases. Picture an old fashioned pharmacy label with a skull and the word POISON on it. Love that for Halloween ideas I have in my head already. I won't tell you about every single thing I purchased, but I will say that I could hardly tear myself away from that booth. It was filled with such awesome goodies. 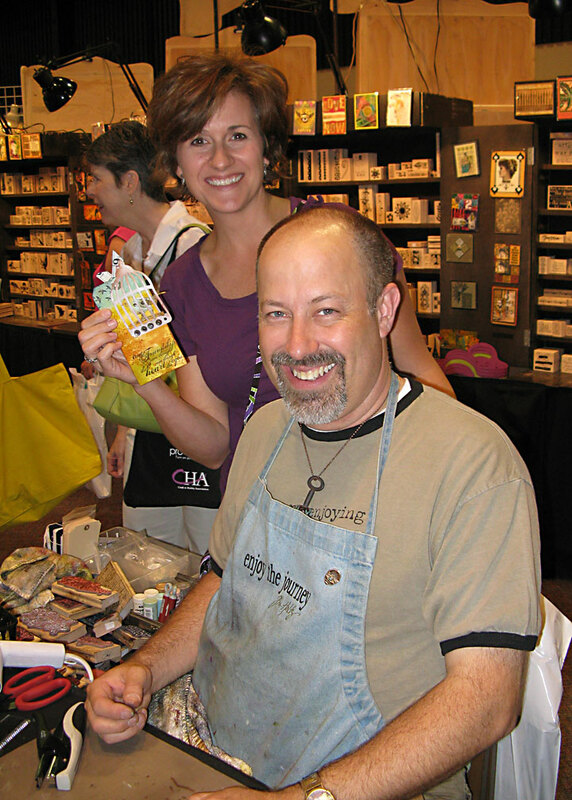 Wendy Vecchi's display was gorgeous and while other stamp lovers ooohed and ahhhed over her samples, I interjected with how wonderful her products are. I'm pretty sure I talked a few people into buying both of her books. My new friend Ted (pictured above) from S.A. was sitting front and center whipping up these cool tags right in front of us, using all kinds of great products in their booth. He was such a friendly guy and had a pretty big audience the entire time. After he demo'd products and finished his tag, he would give it away to one of us! I joked with Ted about giving me a job with Stampers Anonymous. (I'm sure he thought I was super cute and has never been asked this before - - - NOT!) My joking was probably more like badgering, to him. But he was a good sport and put up with me, and I had a fantastic time watching him create and talking with him. When I asked him if he hangs out with Tim, he said, "I write that man's checks! Of course I know him." Cooool. He also admitted they were good friends and that Tim was a really cool person. No surprises there. Finally, after unloading a lot of cash in this booth, I realized I had been there for about an hour. My friends had mostly given up on me, except Tiff. I finally caught up with everyone a little later and enjoyed the rest of the Fest. I popped in on my Orlando friends/consultants at the Close To My Heart booth which was packed full of goodies and pretty items on display. We talked about our upcoming Convention in D.C. this July and gave each other that excited "it's almost here" squeeze. And I even ran into my Melbourne pal Sharon who raced up to me to say hello and we exchanged a big hug. There's really something about the creative community. Such awesome people, such great friends, and such talent. And I love being a part of it. 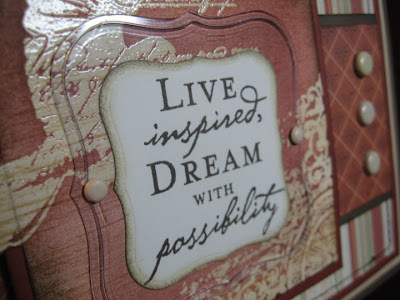 I just love wandering the aisles at Michael's, the Dollar store, and WalMart looking for inexpensive things to cover with paper, stamping and embellishments. 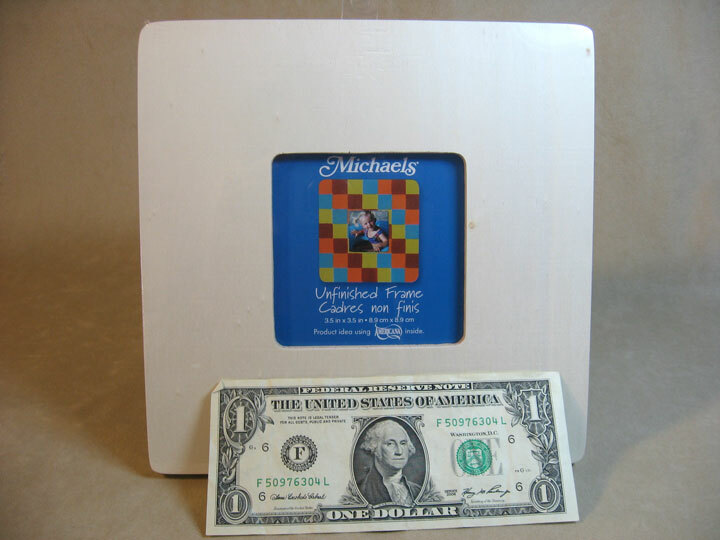 Michael's has lots of plain wood items that are about one dollar like this frame. 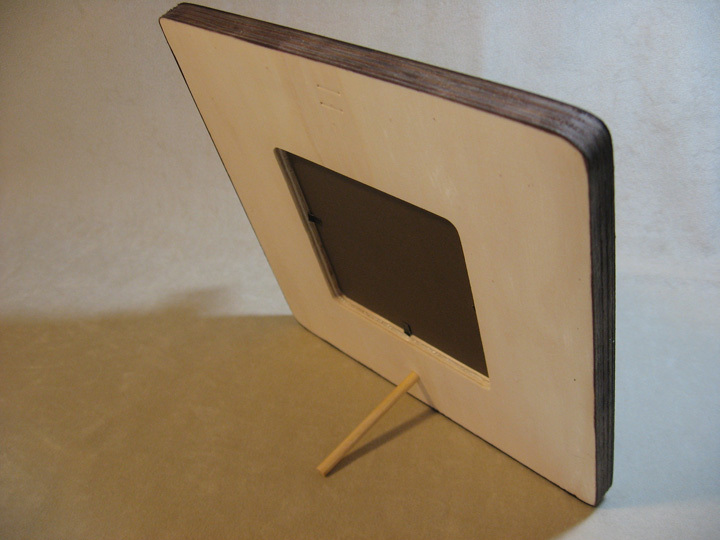 It has a little dowel to put in the back to stand it up, or you can hang it on the wall. So, here's my frame finished. That's my hubby Paul in the hockey mask. He asked me why I used that photo rather than one where we could see his face better. Honestly, he's not that good looking. (ha-ha. Oh yes he is!) Actually, I really like this photo of him because I think he's pretty tough looking as a hockey player. I also think it's cool that he still plays hockey at 51. And he loves it! He sometimes plays with really old guys and they call him "kid" on the ice. I started off by painting the frame with a diluted brown acrylic paint so it appeared more like a stain. Why didn't I just use a stain? I didn't have any on hand and I had plenty of acrylic paint. After it dried, I just started digging out scraps of reds, blues and tans from various Close To My Heart paper packs I have here. The frame is a nice size so that the squares of paper can be cut an even 2 x 2 and the rectangles are 1 1/4 x 2. 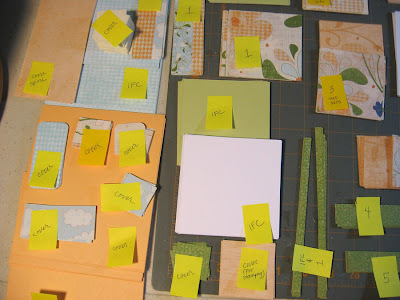 What a great use for paper scraps! 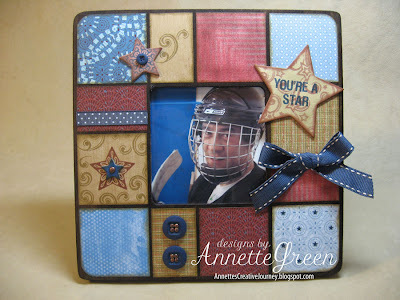 I could make a million of these frames with all the scraps I have. The buttons and ribbons are Outdoor Denim and I added some Antique Copper bitty brads in the holes of the two big buttons at the bottom. I like how that turned out. Different. The stamps I used are Star Power and Wishing Star. 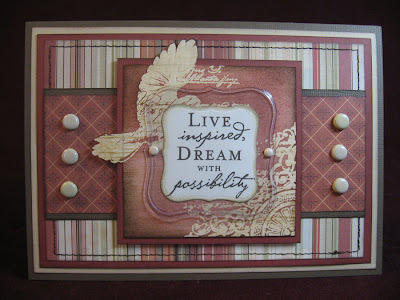 I inked everything will Desert Sand and used Desert Sand and Barn Red inks for the stamping. Before adding the embellishments, I gave the frame a light coating of acrylic sealer. The plain frame didn't come with anything to protect a photo so I cut a square from a page protector to fit in the space. All in all, it took me less than an hour to complete the whole thing. My dad's birthday is tomorrow, June 11th. He'll be 68 years young. He's healthy, has a great sense of humor and works very hard. He's also a pretty creative guy. Ever since I can remember, he's worked in the field of design; freelancing in his office in our basement in Michigan when I was little. Now the president of his own advertising agency since 1984. That's 26 years! 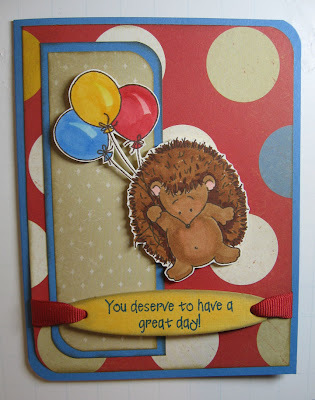 So this card is for Dad. For now, I'll share what products I used to make this card. Items with numbers are Close To My Heart exclusively. Stay tuned for video instructions! I dug out an old craft tool I had almost forgotten about and decided to put it to use. It's my good ole Fiskars paper crimper. 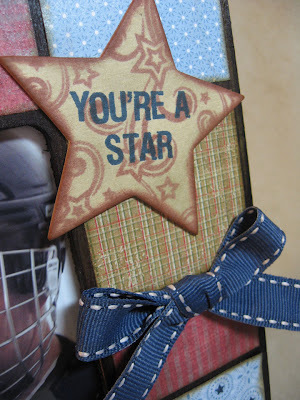 Recently I saw a card in Stampers Sampler using this tool on a card and it inspired me to do the same. I'm not sure how often I used this crimper or what I used it for exactly. I know I only used it occasionally if I can't remember anything about it. 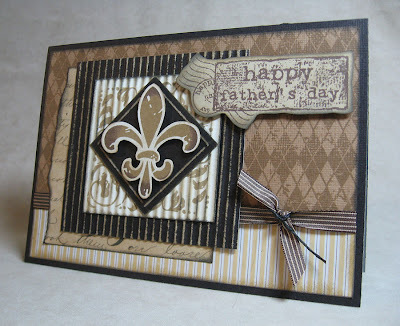 But now that I'm using only Close To My Heart cardstock with its fabulous white core, this was a great tool to dig out from the dark corner of my craft closet. Imagine crimping a square of black cardstock then sanding those crimped bumps to expose that white core. Then apply ink on a sponge to those exposed bumps and voila! Super cool textured effect. I experimented and stamped another square of cardstock, this time Colonial White, with a nice flourish image, then sent it through the crimper, then inked the edges and the bumps. No sanding this time. Another cool effect! Don't you just love it when you can dig up something you forgot about and put it to good use? I know I do. If you have a crimper stowed away somewhere, I challenge you to find it and try something cool and current to make with it. Send me a photo. I'd love to see your creation! June seems to be bustling with happenings! First off it's Jackpot June with Close To My Heart. All kinds of great surprises and give-aways with this fun campaign. 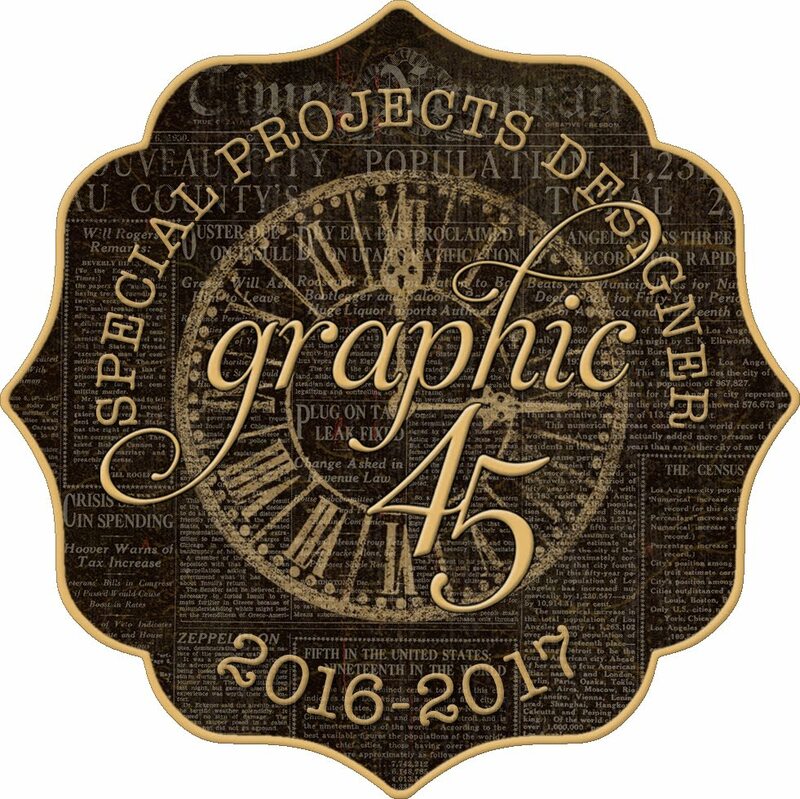 Just go to my website and see what daily special is running, place and order and SAVE tons! 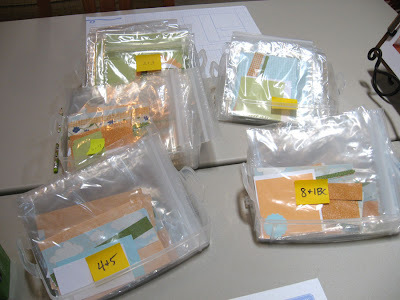 And some days contain a mystery goodie box filled with loads of CTMH treasures at a huge discount. It's really a great time to stock up on your scrapbooking and stamping supplies. Yesterday was a goodie box day. Did you get yours? My June Kit of the Month is now available. The four pages in the kit are shown above, using the beautiful Passages Level 1. Everything's included. All you have to do is contact me to order your kit! I provide cutting guides, photos and instruction, all for only $13. 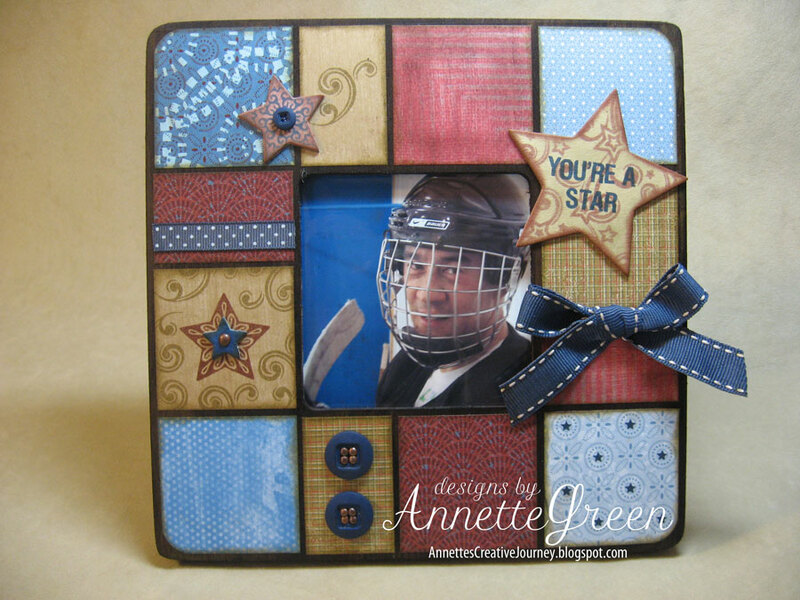 And I've added a NEW Kit of the Month for the stampers/card makers out there. 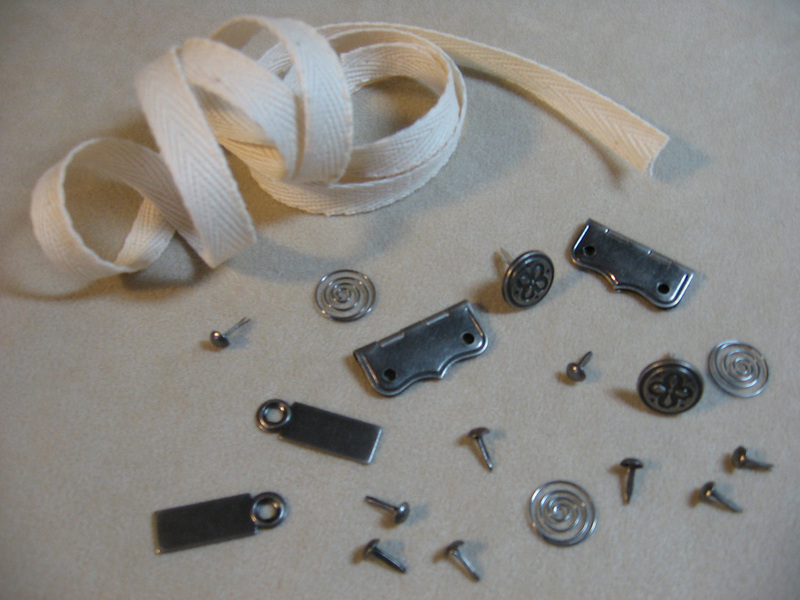 Also using the Passages papers, the kit includes the supplies to create the six cards shown here, the pewter embellishments, a yard of twill ribbon, and the Be Happy stamp set. 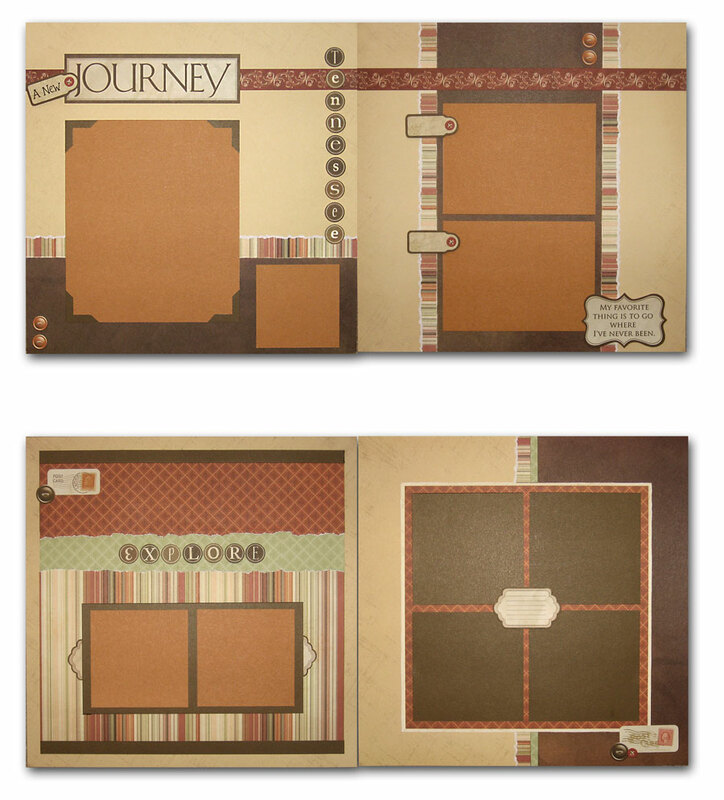 This kit is only $24 and will also include photos, cutting guides, and instructions. Be sure to check out the quick slideshow below to see each individual card. 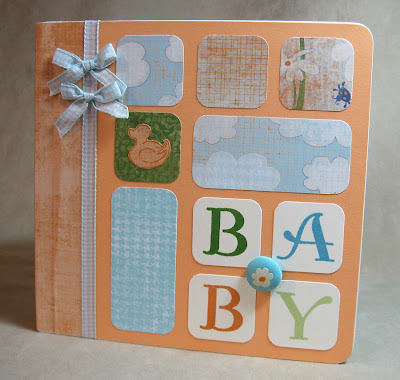 Another offering in June is my 6 x 6 Baby Board Book, and giving the option for guests to choose from Baby, Pet or General theme since not everyone is in need of a baby book.